Synopsis: An animated adaptation of The Wind in the Willows followed by an adaptation of The Legend of Sleepy Hollow. Review: In going through items to feature in my 31 Days to Scare, I often forget to include some kind of film the whole family can watch together. So pulling The Adventures of Ichabod and Mr. Toad off the shelf seemed like a good idea because what I remembered of it was that it started benignly enough with the light-hearted foibles of characters from The Wind in the Willows and ended with the scary treat of The Legend of Sleepy Hollow. Admittedly, it had been years since I’d seen either short (each about 30 minutes) so revisiting this lovely little package of hand-drawn animation was as much a joy for me as it would be for you and your family. 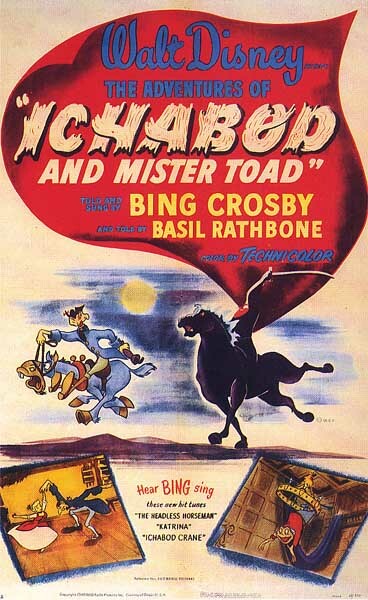 Released in 1949 (a mere four months before Cinderella), The Adventures of Ichabod and Mr. Toad starts off like so many of the Disney animated films do – that of a live-action book opening to reveal the story to be told. The first segment features eccentric dandy Mr. Toad and his comic antics that almost causes him to lose his beloved Toad Hall to a bunch of wily weasels. Aided by his friends Badger, Rat, and Mole, Mr. Toad must prove his innocence after he is wrongly convicted of stealing an automobile and goes on the run to clear his name. Narrated by Basil Rathbone , the animation in the Mr. Toad passage is truly top-notch (the film won a Golden Globe…for cinematography!) and finds Disney artists working at the top of their game. The landscapes are beautiful and the way the fast-moving action is oriented drips with creativity and the type of inspiring imagination that was quickly becoming Disney’s calling card. It’s also heartily funny, with Mr. Toad’s frenzied zest for fun fairly infectious. Based on a small section of Kenneth Grahame’s popular children’s novel The Wind in the Willows, it was always interesting to me Disney didn’t revisit this character. Before this was released, it was Disney’s wish to animate a full version of The Wind in the Willows but sadly that never appeared. Still, you can take Mr. Toad’s Wild Ride at Disneyland if you need a Willows fix. Moving into the next sequence, the narrator (Bing Crosby, who also sings three swinging songs throughout) welcomes us into the tale of Ichabod Crane, the meek schoolteacher in Sleepy Hollow that falls in love with a beauty but runs afoul of a legendary headless rider that haunts the woods. This part of the film is why I wanted to feature it in 31 Days to Scare, but I didn’t remember it as clearly as I thought because it only turns dark and scary for the last ten minutes. The majority of the short is bright and breezy following Ichabod’s falling for Katrina van Tassel, much to the annoyance of local big shot Brom Bones. Crosby croons out two nice ditties and one with an ominous bounce as Brom retells the legend of the Headless Horseman. Based on a short story by Washington Irving, parents won’t need to be on high alert because when the film does move toward its scary finale it’s tempered with comic action and a few false endings. As an adult watching it, I appreciated the pace but young kids are either going to get freaked out when the ghoul does appear or be asleep by the time he does. The animation isn’t quite as strong as the Mr. Toad sequence (and boy oh boy does Katrina look an awful lot like Cinderella!) but the touches of Disney charm again are much appreciated. I grew up watching both segments individually on the Disney Channel…this viewing was the first time I’d ever seen them in their original packaged presentation. Many of these old Disney films have some cringe worthy bits that are definitely not PC but both parts that comprise The Adventures of Ichabod and Mr. Toad are free from any such historical snafus. Not that there aren’t elements we can’t learn from and have discussions on today, it’s just nice to have an example that’s free of perceived controversy.